How to Wear White — Anna Akbari, Ph.D.
Tis the season to break your finest white clothing out of hibernation. While we at Sociology of Style are advocates of creating your own style rules, it’s hard to disagree that white is a summer quintessential. Here are some new takes on an old tradition. J Crew Cafe Cropped Capri Pants White clothes often carry a more casual connotation, but not this beautiful pair of silk and linen-blend pants by J. Crew. Easily dressed down with bold accessories, it serves the same function as your favorite pair of white jeans. Wear it with a blouse and black pumps, and the pressed creases easily blend into a professional look. The black grosgrain stripes break up the coloration and define the silhouette. Sabine Chevron Crochet Blouse The great thing about wearing a neutral color is that it gives you a little more wiggle room in trying out busy patterns. The sheer chevron on this blouse perfectly takes a cream boatneck tank to another level – rather than looking overdone or sloppy. ModCloth Fancy a Flutter Dress White dresses can be hard to pull off. 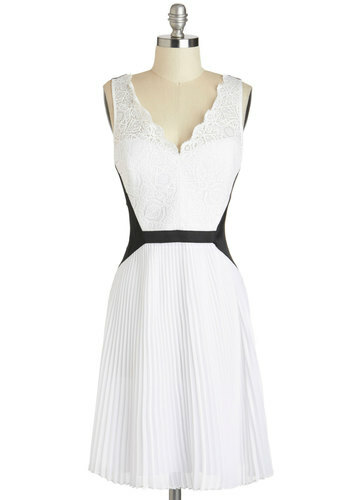 The black paneling on this ModCloth number and billowy, breezy knee-length looks bold instead of bridal. Fluttering accordion pleats and a lace-scalloped, V-shape neckline break up the monochrome colors in a sweet and summery way. DKNY Shawl Collar Open Blazer Navy blazers look sharp, and colored blazers add character to an outfit. Why not do both at once with a white blazer? The shawl collar and relaxed fit on this jacket by DKNY are at home both in a meeting and out on the town. 9seed Tulum Cover Up Of course, clean white is perfect for summer, against tanned skin and colorful accessories (like one of our favorite bold sunhats.) Try taking this one to the beach – the sheer gauze fabric will accent basic black bathing suits just as well as crazy patterns. The flowy tea-length on this cover up won’t leave you feeling overexposed, even when you leave the water.